I’m going to talk about karma from the perspective of SourcePoint. This is only one perspective among many, and is simply another way to view the complex issue of causation and incarnation, not a definitive “answer” to the questions that we have about karma. From a SourcePoint perspective, we could say that karma manifests as patterns or imprints we carry in our energy/consciousness from prior experience. Just as the Blueprint of health for the human being is an energy pattern that transmits the information of Order, Balance, Harmony and Flow, so our karmic blueprint would be the energy pattern that transmits the information of our prior experience and “informs” our physical body at the time of incarnation. From this perspective we could say perhaps as consciousness disperses at death, the imprints, the patterns, the information of one lifetime, are released into the great energy/information field, and then re-form, incarnate, manifest into physical form once again, in alignment with familiar genetic-biological patterns. Pattern is drawn to pattern, information to information. This is another way to look at reincarnation and rebirth. Using the term blueprint we can understand that form arises from interwoven layers of intersecting blueprints, templates, patterns, and information. From this perspective rebirth is not a linear process in the way that people often think of reincarnation. The dance of pattern, the melding and re-shaping of consciousness is a constant process. Information doesn’t go away; it changes according to causes and conditions. Information is constantly reborn into new forms. This seems to be the nature of the universe; why would human beings be any exception? At any given moment the condition of the body-mind is arising from and connected to countless stories and fields of intricate information. To ignore the level of karma when working in the field of energy medicine is to limit our effectiveness as practitioners. From a SourcePoint perspective, the body is a complex of genetic blueprint, karmic blueprint, and universal blueprint, for starters. When we hold or visualize the Diamond Points we connect the karmic/genetic blueprints to the universal Blueprint of health. We are reminding ourselves of who we are, of our essential nature and highest potential. In most people the karmic blueprint is the primary force. 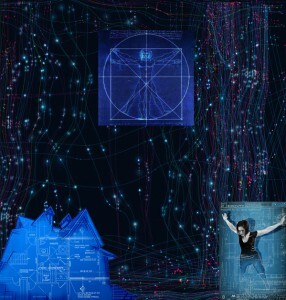 In connecting to Source we strengthen the presence of the universal Blueprint information in the body. In SourcePoint, we recognize karma as an essential element of our human lives, one that we work with carefully and consciously. So rather than “clearing karma,” we work with bringing the information of the universal Blueprint to the karma. That information restructures the body and its karmic patterns so that we can live in greater alignment with our true nature of Order, Balance, Harmony and Flow.